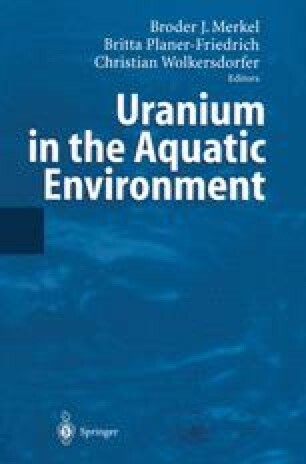 Uranium removal from shallow lakes ranged from 0.15 kg.d-1.ha-1 to 0.65 kg.d-1.ha-1, while 226Ra removal ranged from 0.05 to 0.2 MBq. d-1.ha-1 in the Rabbit Lake drainage basin in northern Saskatchewan, Canada. The removal of U is related to the organic and inorganic components of the TSS in the lakes but 226Ra is concentrated by stoneworts (Characeae), a family of macrophytic algae. 226Ra concentrations in algal biomass range from 5 Bq.g dry weight-1 (gdw) to as high as 50 Bq.gdw-1, averaging 20 Bq.gdw-1. These alkaline minerotrophic lakes can be integrated into a decommissioning approach.